In this video, I show you how to make a DIY bike rack for $20! 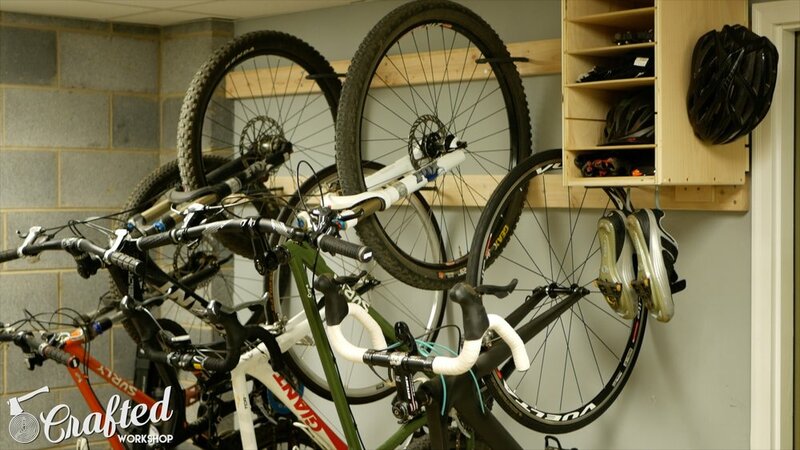 This rack is perfect for bike storage in your garage, apartment, etc. The only tool needed is a drill! 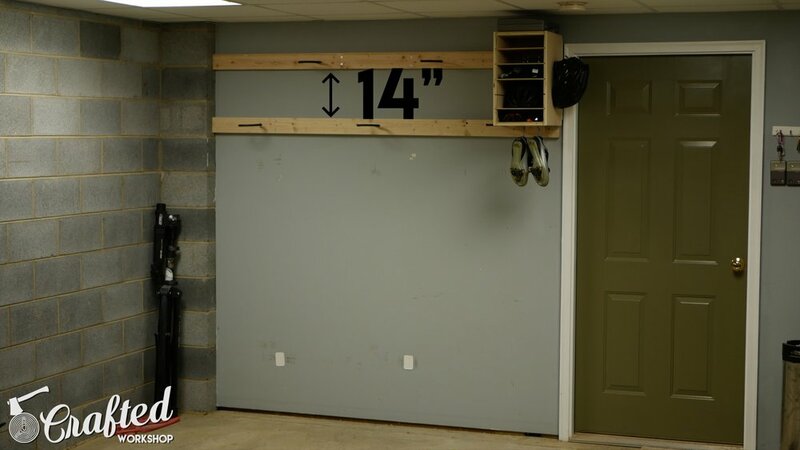 Enjoy, and hopefully this woodworking project will help your bike area become a little more organized. To start, clear out your area and measure the amount of space you have available. As a general rule of thumb, you'll need roughly one foot per bike, plus a foot on either side. For my five bikes, I needed roughly seven feet of wall space. I cut down two 8 foot 2x4s to length and mounted them to my wall using 3 1/2" screws. I checked for level on each 2x4 before mounting. Make sure the screws go into your studs, as these pieces will be supporting quite a bit of weight. I used two screws per stud, which might have been overkill, but better safe than sorry here! 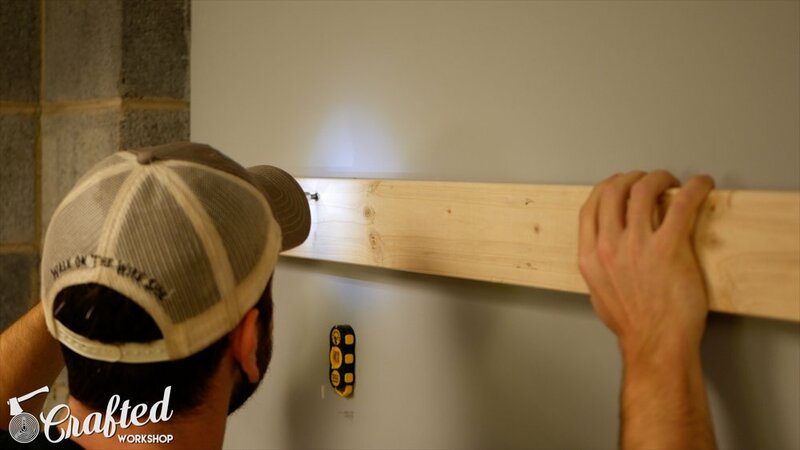 Let's talk about the measurements for placing the 2x4s and the hooks to make your DIY bike rack. The lower 2x4 should be roughly 65" from the ground. This height will accommodate most bikes, but it's best to measure the length of your bikes before mounting. My Surly Ogre, for example, is longer than average, meaning I can only mount it on the top rack section without it touching the ground. The upper 2x4 should be 14" above the lower 2x4. This placement allows your bikes to be staggered, meaning that their handlebars won't interfere with your other bikes once your bikes are mounted. Your hook placement should be roughly 24" from the next hook on the same row. Since a few of my bikes have wider handlebars, I spaced my hooks 26" apart, but this, again, will depend on your bikes. Place the hooks in the upper row in the center of the hooks in the row below. 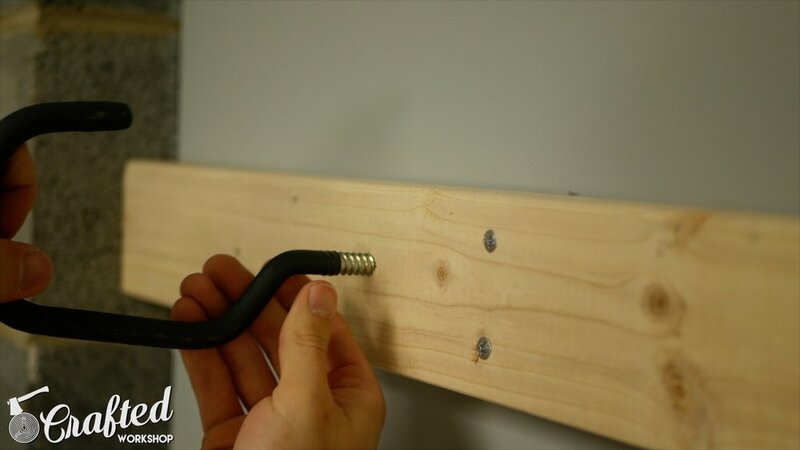 To mount your hooks, pre-drill holes using a 3/8" drill bit and then thread the hooks into the hole. Test fit your bikes along the way so that you can make any required spacing adjustments. Once your hooks are mounted, the basic DIY bike rack is done, but I wanted to add a little cabinet for storing bike accessories. For this, I used pieces of scrap 3/4" and 1/4" plywood I had on hand. To start, I trimmed two pieces to length based on the space I had available at the end of my rack. These pieces make up the top and bottom of the cabinet. Next, I cut 1/4" dados into my side pieces to accept the shelves. I wanted the shelves to be adjustable, so I cut 1/4" dados spaced every three inches. The shelves will be able to slide in and out of these dado slots. Instead of installing a dado stack, I made the cuts in two passes, moving the fence over 1/8" between passes. I assembled the carcass using 1 1/4" screws, making sure to pre-drill to avoid splitting the plywood end grain. For mounting the cabinet to the wall, I decided to use a French cleat. I cut two pieces of plywood at 45 degrees, which will allow them to fit together later to form the cleat system. I wanted to use some of the small pieces of plywood scraps I had hanging around. I wanted some airflow through the cabinet to allow helmets, shoes, or other sweaty items stored within the cabinet to dry. I wanted to keep the weight of the cabinet down. After cutting the back pieces to length, I attached them using 1 1/4" screws. I made sure to leave enough room below the French cleat to allow me to put the cabinet onto the matching cleat, and I also placed the back pieces so that the shelves wouldn't be able to slide past the back of the cabinet. To install the French cleat, screw it onto the rack using 2" screws, making sure it's level and that the beveled edge is facing the wall. To install the cabinet, just slide the opposing French cleat onto the cleat on the wall. This is actually the first time I've used a French cleat, and I'm not sure what took me so long. This system is incredibly simple and can be made with nothing more than scrap plywood. I cut the shelves to size at the table saw, using 1/4" plywood. As you can see, having extra dados available makes the shelves adjustable, which is great in case you decide to store different equipment on the shelves. Last, I added a few hooks to the bottom of the cabinet and chamfered the edges. In case you're wondering, the ragged edge of the plywood was from having the plywood cut at the home center. I won't be doing that again! After cleaning up the cabinet, your DIY bike rack is done! This DIY bike rack build was much needed and I'm glad I built my own rack instead of buying one. If you liked this build, check out my other woodworking projects here. To make sure you don't miss any future videos, subscribe to my YouTube channel! If you really enjoyed this video, consider supporting me on Patreon! And last, follow me on social media on Facebook, Twitter, Instagram, and Pinterest! Thanks for your support.